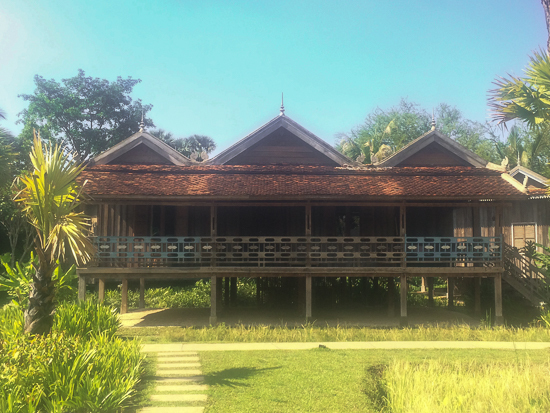 A refined and romantic rural retreat that brings together the elegance of reconstructed Cambodian traditional villas with the luxury of a world class boutique hotel, Sala Lodges can’t help but impress. Ad Book now! Rates from US$243++. Average rating 9.3 from 104 reviews. In a project that took three years to realise, traditional Khmer wooden houses in an array of shapes and sizes were collected from across Cambodia, delicately dismantled and then carefully reconstructed to form a visual delight of a village just 10 minutes’ tuk tuk ride from the Old Market area. (Desa Seni in Bali follows a similar concept, with houses assembled from around the Indonesian archipelago.) Each building emerges from amid green gardens exemplifying exactly how to transform the seemingly simple into something wonderfully elegant. This is a small property that stands out for effortless charm and personality — though it does have a price tag to match. Each of the 11 buildings that make up this haven is as individual as the hotel itself. 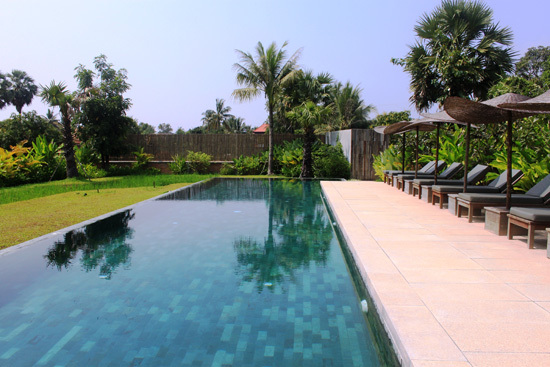 Nine houses fit two to three guests, and an additional two villas work for four to five guests – excellent family options. One of the smaller villas, but no less lovely for it. 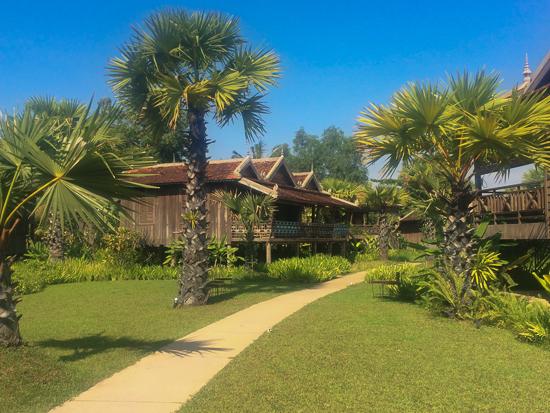 Urbanites may particularly appreciate the contrast Sala Lodges can offer from a frenetic city life, where alongside meandering paths rice grows decoratively under lofty palm trees in this very special bucolic backyard. But the timber houses have not been left completely countrified. Where a kitchen once would have stood you can now expect a clean modern finish to an ensuite bathroom. The houses have been adapted to meet rigorous hotel standards, rather than the rough-around-the-edges appeal of an authentic homestay, so there’s no need to worry about a lack of air-con here despite a homey feel. In contrast to the authentic appeal of the wooden houses, outdoor living spaces reserved for guests and the building housing the main restaurant, The Monolith (open to outside guests), have a contemporary design. 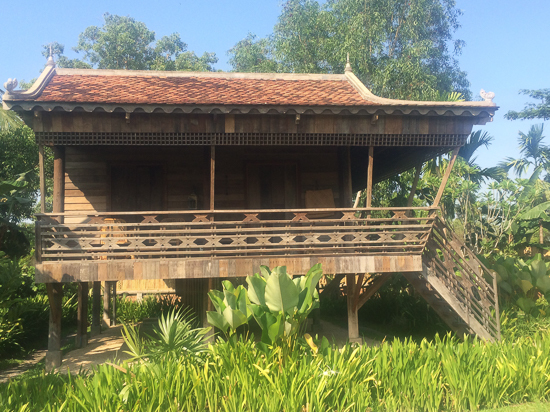 Make yourself at home, Cambodia style. In keeping with the simple nature of the wooden houses, the tasteful room decoration follows a subtle, timeless approach as opposed to elaborate ostentation. TVs can be requested, but we think making the most of the verandas, the gorgeous wine list, modern restaurant, or the 20-metre long infinity pool are much better ideas. Modernity in all the right places. Though it doesn’t have the full services of a fully-fledged large hotel — there’s no spa on site, but in-room treatments can be arranged — this is a property well with considering if you have a budget to splurge and are looking for some rest and relaxation to slow your pace down. They’re offering three-for-two on rooms for minimum bookings of three nights.